In many communities around Greater Washington, attempts to improve transit, accommodate walkers and bicyclists or do infill development are often controversial. But a new survey suggests that public support for these and other measures is high in both urban and suburban areas. Most people support better transit and pedestrian and bicycle infrastructure. All images from the Regional Transportation Priorities Plan. Over the past 2 years, the Transportation Planning Board, which coordinates road and transit planning efforts across the DC area, has identified ways to improve the region's transportation network to support future growth. As part of the process for creating the Regional Transportation Priorities Plan, TPB surveyed area residents on what transportation issues mattered to them. TPB mailed out 10,000 inquiries to randomly selected addresses across their planning area, which includes 13 cities and counties in DC, Maryland and Virginia. The agency received 660 responses, and the results are surprising. 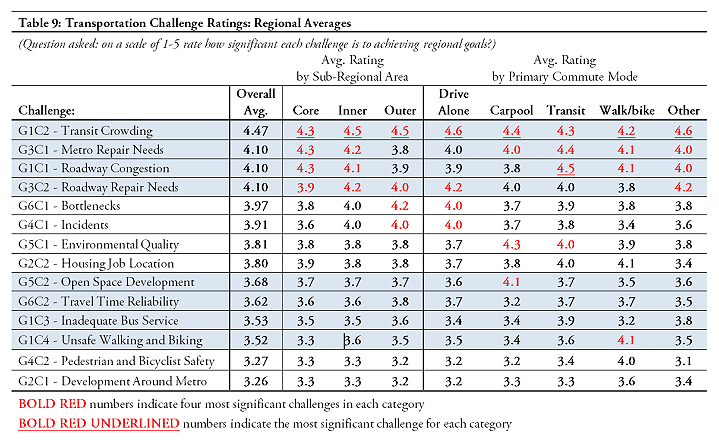 First, TPB gave survey respondents a list of 14 transportation challenges in the region and asked them to rate each one's significance on a scale of 1 to 5. The top four responses were transit crowding, repairing Metro, roadway congestion, and road repair needs. Respondents gave each of those issues an average score of 4 or higher. Survey takers also ranked as major challenges the distances between housing and jobs, pressure to develop open space and inadequate bus service. Pedestrian and bicyclist safety and building around Metro were at the bottom of the list, but with average scores of 3.27 and 3.26, people still considered them significant issues. No matter where people live or how they get around, they agree that transit, bike and pedestrian access are major transportation challenges. Planners broke out the scores by where people lived and how they commuted to work. Surprisingly, people's responses were similar whether they lived in the urban core or the inner and outer suburbs, or whether they drove, carpooled, took transit, walked or bike to work. While this is a small sample, it suggests that people across Greater Washington want more options in how they get around and what kind of communities to live in. This survey lines up with findings from other studies that there's a lot of demand for compact, walkable, transit-served neighborhoods. 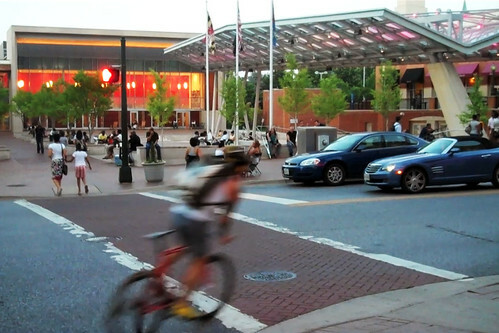 People want more places like downtown Silver Spring. Photo by the author. The DC area is a national leader in creating and sustaining places like this, whether traditional urban neighborhoods in DC or in newer suburban downtowns. But there's still a small supply of these places relative to demand, especially the ones that are safe and have high-quality public services. As a result, prices for these places can be prohibitively expensive, and people who might otherwise choose a walkable, transit-served community may opt instead for one where they have to drive everywhere, putting further strain on our transportation network. Yet many neighbors and sometimes even community leaders fight attempts to make TPB's proposals a reality, whether it's building homes near a Metro station, giving cyclists a safe route across downtown DC, or extending transit to underserved areas. While the opposition may be vocal, this survey shows that in reality, most people are fine with these changes, provided they're done in a sensitive manner. Public input is an important part of any planning process, but planners and community leaders often hear only from a very small segment of the public that's opposed to any change, good or bad. Surveys like this can help them understand what people actually want and care about. The bus stop on Viers Mill to get to MCC Rockville is a mile from my home, too far for the semi-disabled to reach - someone has to drive them to it. "Walkability" plans are great if you can walk well far enough - and that's not true of everyone, such planning has to consider the disabled or at least the semi-disabled who can't go very far without sitting and/or needing to be dropped off. The bus route back from MCC Rockville is always too crowded, planning new dedicated bus lanes doesn't address when not enough buses are sent a location despite complaints. MCC Takoma location buses weren't so full, but proved too cumbersome for the semi-disabled to use public transit, since they need two bus stops because the school has two portions and ramps for both sides of the bridge on the one portion. My area, btw, by the usage map indicators, uses the public transit system far more than the "wealthy" areas of MontCo like those living on 355, and also uses the attractions of said area as much or more. And yet, the stop needed to get to 355 is one mile away, and there's no where there to keep parked the car. oh sorry, badly edited. There's a pedestrian bridge by Takoma with a wheelchair ramp on one side, stairs on the other, requiring somebody using a wheelchair to random help from strangers on the other side if they haven't someone carrying them. Sounds absurd, but it's real. What I meant to say if there's a bridge, both sides should have ramps. 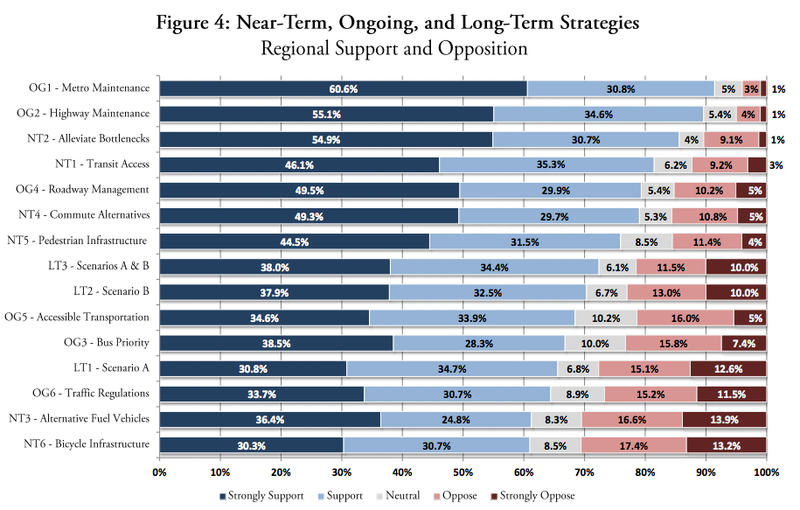 Looking at figure 4, it appears that at least 60 percent of the respondents were in favor of each of the listed items. This suggests two things: 1. we need to see the wording of the questions to be sure they weren't worded in a way that elicits a favorable response as opposed to a weighing of the various options, and 2, the those who went to the trouble of mailing back their responses may not be representative of the public as a whole. I agree that building a bridge with a ramp on only one side is short-sighted, and it's totally important to plan for people with limited mobility. But right now, places that aren't safe for fully-abled people to walk are definitely not safe for those who can't walk very far, or at all. This survey would be an outlier if there weren't other surveys (like the one I linked to) that said basically the same thing for a bigger sample. And it's not like this is a development firm that commissioned this survey. It's a metropolitan planning organization whose job is to plan for future growth and transportation needs. I would think that earns them a little credibility. GAH! I hate hate hate that I keep coming back to this kind of thing with data you report on, Dan, because I do fundamentally agree that more transit and walkability is a good goal (yes, I support compromise between transit improvement and preserving private vehicle ownership, no need for me to rant...again). But really, the survey methodology here is horrible and reliant on motivated respondents. The survey source is marginally better than if it were commissioned by developers, sure. But this is the same kind of research that led to media predictions of a Dewey victory in 1948. Which is unfortunate. Really, really unfortunate, because people using poorly gathered data to actually oppose transit improvement is an obnoxious distraction that saps constructive energy.